Reclaim and Maximize Space in Your Bathroom! I’ve always wished for an expansive bathroom and never really thought we could achieve a spacious feel without actually enlarging the space, but we did just that! Renovating a bathroom gives you the ideal opportunity to maximize the space you have (and even achieve more of a spa-like feel)! Today, I’m showing you a renovation we recently completed and what we did to gain both storage and a feeling of spaciousness. Some new home builders cut corners when it comes to maximizing space. Instead of building in storage solutions, they tend to drywall up valuable real estate. That’s usually the case when it comes to 5 foot bathtubs. Can you see that vertical piece of wall at the end of the bathtub run below? It was just begging for some built in cubby holes. See how easy it is to reclaim space you had all along? When we replaced the vanity, we looked for a style that had the greatest number of drawers so that we could reclaim the vertical storage beneath. When one has cupboard doors, so much of that space goes unused and it’s not easy to keep organized in the space you do have! When you’re renovating, it gives you the perfect opportunity to remove any bulkheads and expand the ceiling height over the tub. To take full advantage of the space we gained, and brighten up the shower area, we installed a water proof LED potlight as shown below. The vertical placement of the white tiles also helps with the illusion of more height (even with the horizontal accent stripe running through it). One area to gain space is with a shower niche; it gives you somewhere to put the soap and a bottle of shampoo. I find it best to use a solid surface material – at least along the bottom, if not around the entire niche – so that soap scum and spills can be easily cleaned away. If we had used the glass and marble accent tile along the bottom of the niche, it would collect soap in the grout and over time it would just look grungy! Another area where builders cut corners is with ventilation. If there’s a window in the bathroom, they rarely bother to install a fan – but who wants to open a window in the winter and let out all that valuable heat along with the steam? Since you’re renovating anyway, why not take the opportunity to install a new bathroom fan (you’ll be glad you did)! 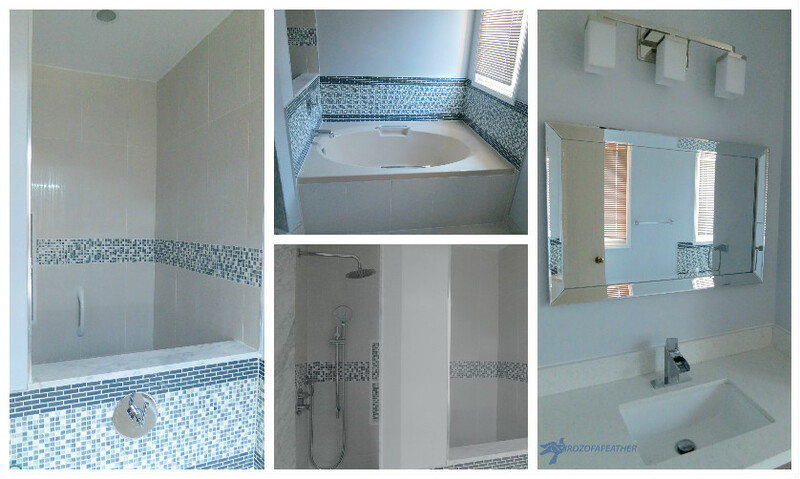 To gain a sense of spaciousness, consider the style of bathtub you choose. Here the bathtub is a standard 5 feet, but it bows out at the front. It’s still the same footprint as the old tub, but more spacious inside. The curved feature on the front of the tub gave us the opportunity to repeat that feature with the installation a curved shower rod to replace the old glass door (which was always a pain to keep clean). Have you ever been in a shower and the liner gets sucked in with the heat and just sticks to you? A curved rod should help keep that situation under control (another trick is to buy a curtain liner with suction cups). Overall, I find a shower curtain and liner much easier to maintain than a glass door as they can simply be tossed in the washing machine to clean them up! Finishes can have a big impact over how spacious a room feels. The lighter colour scheme we chose with hits of black and grey to contrast tends to open up the space and makes it feel airier. The bevelled mirror – with mirrored frame – also helps to bounce light around and adds sparkle to the bathroom. Next time you’re renovating a bathroom, think about all the possibilities there are to reclaim additional storage and work it into your plan! This entry was posted in Bathroom Makeovers, DIY by Sara. Bookmark the permalink. Another fabulous Sara remake. I love the elegance of the bathroom, and agree with you on the efficiency of drawers. It’s nice having higher counters, too, isn’t it? I’m tall, so for me that is especially a plus.